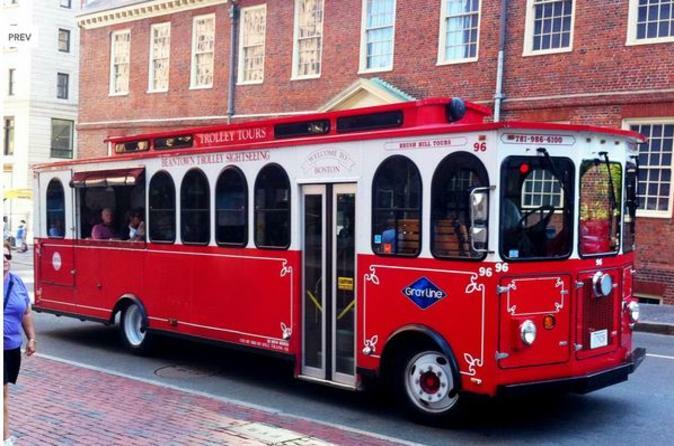 Celebrate Boston’s history with a sightseeing tour on the Beantown Trolley, a great way to see top Boston attractions including Beacon Hill, Boston Common, and the Freedom Trail. Enjoy the full 3 hour narrated tour on this San Francisco-style trolley car. There are 3 picture stops at Copley Square, Fenway Park, and the USS Constitution along with more than 100 points of interest along the way. Hop on the Beantown Trolley, a San Francisco-style sightseeing trolley car, and your guide will keep you entertained with informative commentary about the sights you see on the 3 hour city tour. Begin your tour in Downtown Boston. Take time for photos at Copley Square, the Navy Yard, and Fenway Park. See over 100 points of interest along the way including Charlestown, Beacon Hill, Boston Common, the Freedom Trail, Quincy Market, Faneuil Hall, the New England Aquarium, the North End and the Bunker Hill Pavilion.